We treat the natural environment seriously, that is why since the beginnings of our company we believe in the strategy of sustainability. Thanks to the use of innovative technological solutions and a range of logistics services, our projects optimise the use of natural resources and help reducing the negative impact on the environment. In logistics the choice of an appropriate packaging for storing and transportation purposes is always a result of a range of compromises. Things we need to take into account are: the type of used materials, intended use, and durability, as well as the costs of transportation and storage. What is more, all of these factors are correlated with a required level of protection of transported goods. We take your requirements into account, that is why we offer you a service of designing a customised package. According to the idea of sustainability of development, while using the best available materials, we provide the most favourable solutions. An individually designed package means greater ergonomics of work, as well as higher productivity and a noticeable boost of efficiency. What is more, thanks to advanced logistics services, almost every pallet, crate or container, regardless of used materials, can be used again. Because of that, we also reduce their negative impact on the environment. Apart from the packaging design service, we offer you a chance to manage the returnable packages, and if you use our pooling service, you will use your containers more efficiently. You will not have to worry if there are any damaged packages, because in our RTI Management department, we try to make sure that your pallets and containers are always functional and ready to work. This way you can extend the lifespan of your packages and postpone the costly process of disposal of damaged ones. If for whatever reason, purchase of new packages is not possible, as an alternative we offer you a service of packages rental. 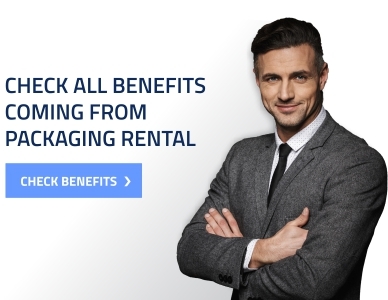 Because of it, you can avoid a costly investment, saving storage space in your warehouse, and ensuring the maximum use of each of the rented packages. 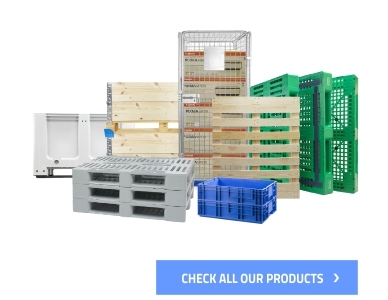 Our wide range of rental products includes wooden and plastic pallets, rollcages, metal boxes and plastic crates, or Mobilrack storage systems. Logistics packaging rental, reduces the production of new ones and has a positive influence on the environment and our clients' logistics costs. Functional packages mean that your supply chain is efficient and safe. Our goal is to make sure that life cycle of our products is as long as possible. Thanks to our repair and maintenance service you can safely store and transport your products. You do not need to replace a damaged container with a new one - very often it can be repaired and remain functional for a long period of time, before you will be forced to recycle it. You should remember about regular maintenance of your logistic means, because this way you lengthen their service life and care about the natural environment.